Names of Products mentioned are used for identification purposes only and may be Trademarks and/or registered Trademarks of their respective company. The goal of real-world decision making is to optimize some combinatorial problem. In order to optimize, one needs criteria, which can be expressed for instance as constraints. Real world constraints are usually vague and have different relative importances. Also, data collected from unreliable sources is often slightly incorrect. Sometimes criteria even contradict each other. Therefore compromises are necessary. Typical application areas of combinatorial constraint optimizers include scheduling, design, configuration, planning, and classification. Test application domains for prototypes are steel-production scheduling and classroom roostering. To investigate real-world combinatorial optimization problems, we have designed and partly implemented the StarFLIP++ family of C++ libraries, especially focusing on reusability and applicability for a wide range of combinatorial problems. The following map gives a quick overview on the most important libraries and their relation. Documentation and details about those parts that have been completed so far are included in HTML and Postscript format. Additional documents on StarFLIP++ can be found in our publications included in Postscript format. The best way to start is to look at the documentation, maybe starting with FLIP++, and then to continue with the corresponding demo applications (precompiled for SunOS 4.1.3, Linux/X11, and MS Windows). 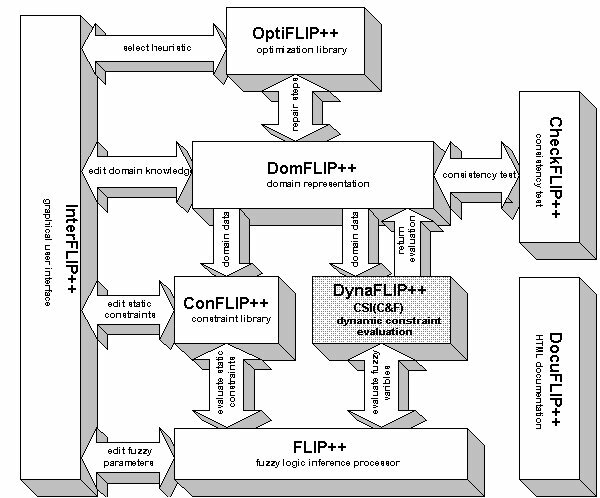 FLIP++ together with InterFLIP++ are currently the visually most appealing parts of the StarFLIP++ project, but we have also included demo applications for the other parts, and they can be found together with the corresponding libraries and executables. More details about the sample applications can be found in the included theses and scientific publications on the StarFLIP++ project.